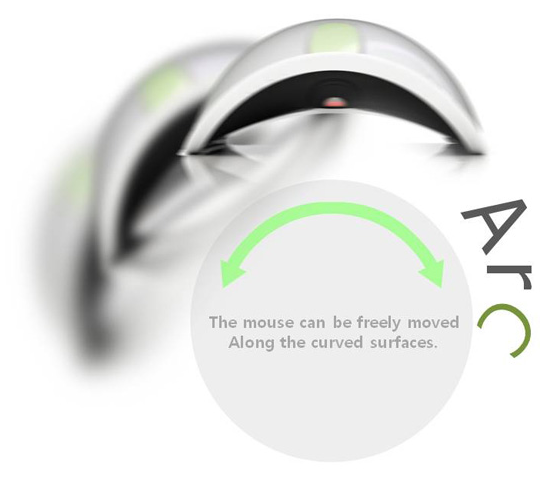 Laptop users who hate their touchpad and often find themselves without a suitable flat desk surface should see the Arc Mouse as a godsend. The brainchild of Seunghoon Shin and Chang Seok Kim, the Arc Mouse, true to its name, boasts a 'C' shaped exterior that hugs curved surfaces, such as one's thighs or the armrests of chairs, enabling smoother operation on such surfaces. Oh, and it surely works just fine on desks as well. 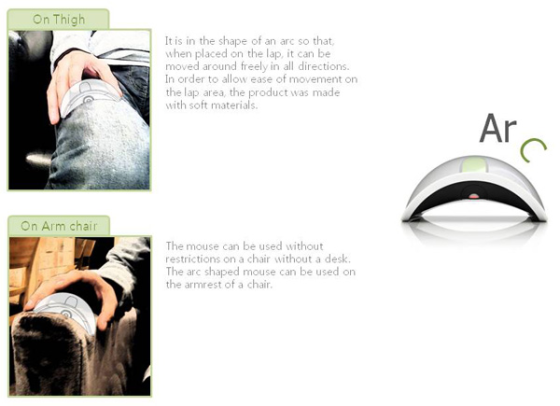 The design allows the Arc Mouse to not sacrifice ergonomics in the name of anywhere-computing, ingeniously enough. This rodent is also wireless, though it'd be interesting to find out how much battery life the designers managed to stuff into the slim case. Aside from the obvious exterior shape, the Arc Mouse works just like a normal two-button mouse. It has a touch-wheel and the optical sensor is positioned near the front of the device. There are no extra buttons, but, being a prototype, such things may be added in the future. The big problem, however, is availability. Hopefully Logitech or someone similarly big will pick up the Arc Mouse design and begin to mass-produce it, one day soon. UPDATE: The Arc Mouse in now available here at Amazon and at other online retailers. 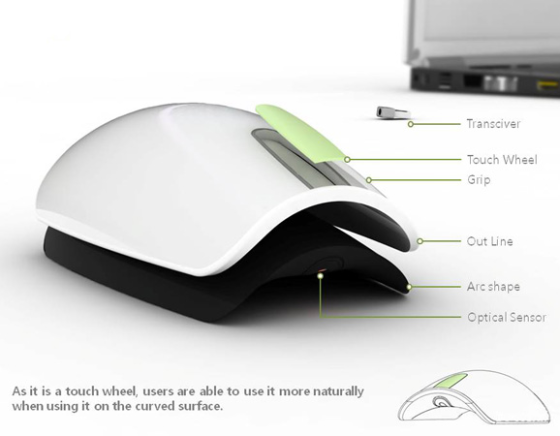 UPDATE 2: The new Arc Mouse Touch is now available. Could The World Cup's Mind-Controlled Exoskeleton Be The Next Frontier Of Medical Technology?